It’s May 1969, and we’re currently nine episodes into a twelve-episode run where Quentin is in every episode. Today, he’s in almost every scene. I made a big deal last week about Quentin winning the Stand Next to Barnabas competition, but honestly, it might as well be the Stand Next to Quentin competition by now. He’s involved in every storyline, in a more natural and organic way than Barnabas is. Laura, Jenny, Magda, Jamison — this is Quentin’s family, not Barnabas’. There are two different moments this week when people apologize to Barnabas for burdening him with family problems. He’s actually an outsider. This is Quentin’s world. And this isn’t just happening on screen, of course. In the world outside ABC Studio 16, the public has taken notice. 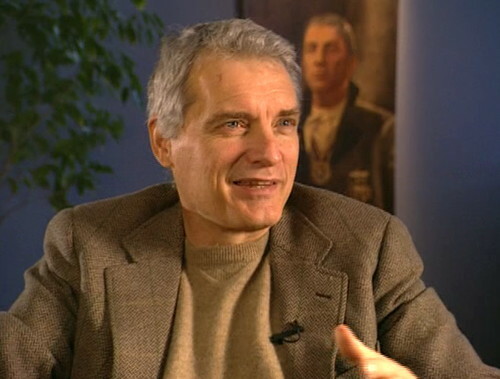 Now, I know I’ve already written a couple posts on the subject of David Selby Figures Out He’s Famous, but I’m doing it again today because there’s an interview on the DVD where he is so amazingly cute about it. Because David Selby is basically the cutest person of all time. He never says, “Yeah, I was amazingly famous and everybody loved me.” I don’t know if it’s a West Virginia thing, or a late 60s soap opera thing, or what. But he always says that people responded to the character, which is adorable. So, 16 Magazine, we meet again. 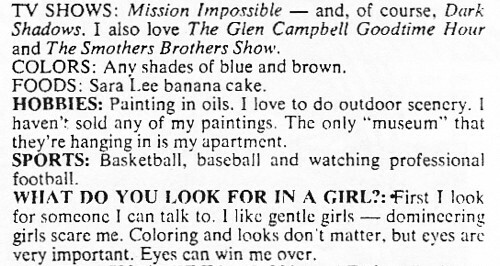 I mentioned 16 about six months ago in the “Win a Date with Jonathan Frid” post, as one of the publications that started following Jonathan Frid around, asking uncomfortable questions about his home life. 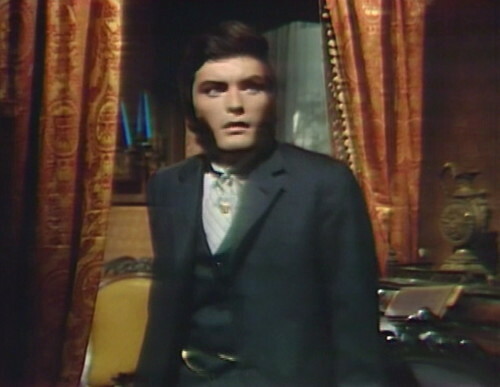 16 Magazine looms large over this period of the series, because by this point it’s basically become the de facto Dark Shadows Fan Club newsletter. 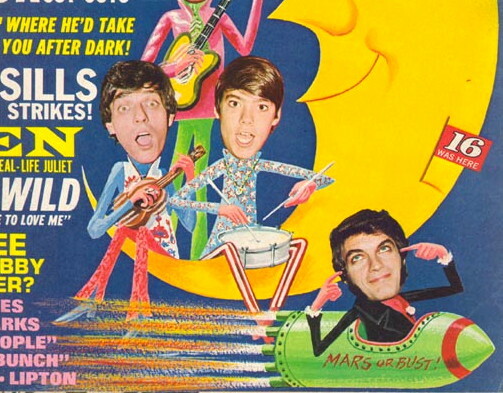 16 covered other things besides Dark Shadows, of course — there’s also the Cowsills, and the Monkees, and Bobby Sherman, and Saj and Stefan and Enzo and other people I’m not familiar with. But in every 16 issue in 1969 and 1970, there’s at least six or seven pages of Dark Shadows material a month. Pin-ups, interviews (both real and make-believe), actor bios (ditto), storyline synopses, contests, quotes, what have you. 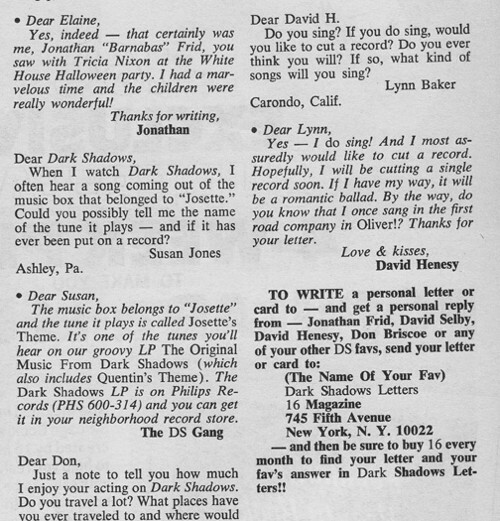 At some point, they start soliciting letters to the Dark Shadows stars to be sent directly to the magazine, and then they print the stars’ responses (both real and make-believe). Apparently, 16 was the official publicity agent for Dark Shadows, and vice versa. It’s in this month’s issue — cover-dated May 1969 — that David Selby makes his first appearance in the pages of 16. 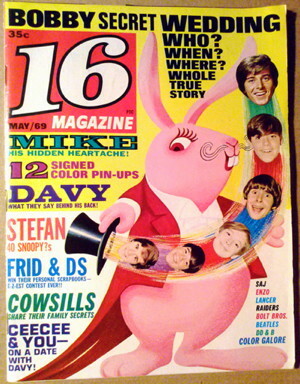 This is, of course, the issue that has a pink rabbit magician on the cover, pulling a handkerchief out of a top hat decorated with the faces of Bobby Sherman, David Henesy, Davy Jones and three other kids who are probably Cowsills or something. 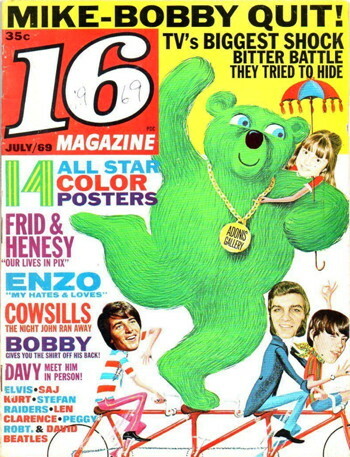 In 1969 and 1970, 16 covers always had photos of the stars’ heads superimposed on an illustration that showed them all hanging out together, often in the company of an enormous animal. I have no idea why this was the case. The very first time Angelique looked at Barnabas, she fell madly in love with him. The portraits of Barnabas and Josette were painted as the wedding plans were being formulated. But on the eve of the big wedding, Barnabas, Josette and Angelique all disappeared! (More about that in a future chapter!) So Barnabas’ and Josette’s portraits were hung in the old house — and many years later, David Collins, who used to play there, claimed that he actually “saw” Barnabas and Josette and talked with their “ghosts”! The ghost of Josette (actually Josette’s life force has been reincarnated in Vicki’s body) comes to Vicki’s rescue. So there’s your challenge, make sense of that. A couple issues later, in the May issue, there’s a two-page article (chapter 4 of “The Whole True Story”) which is nothing but a series of retractions for everything they wrote in the previous chapters. Apparently, Dark Shadows fans with longer memories got in touch with the 16 Magazine top brass and gave them a talking-to. David Collins talked to Josette’s ghost, but never to Barnabas’ ghost. This was because Barnabas was only partly dead. The portrait of Barnabas (as he looked in 1795) never hung in the old house. It has always hung in the present Collinwood. It is doubtful that Vicki is Josette’s reincarnation, because Vicki’s and Josette’s spirit actually exist simultaneously in the past and present. So that clears everything right up, doesn’t it? Thank goodness that’s settled. Anyway, the point is that there’s a little sidebar on the retractions article that says “MEET DAVID SELBY”. HI! I’m David Selby. You’ve seen me in Dark Shadows as the villainous “Quentin” — but I’m not that sort at all in real life. I was born in Morgantown, West Virginia, on February 5th, and I am now in my twenties. I am six feet and two inches tall and I have dark brown hair and blue eyes. I live with my wife (we have been married for five years) in a big, rambling apartment on the west side of New York City. It is really fun playing the role of “Quentin” (even though he’s a rather terrible fellow), and I hope I’ll be around Dark Shadows for a long time (unless little David does me in!). 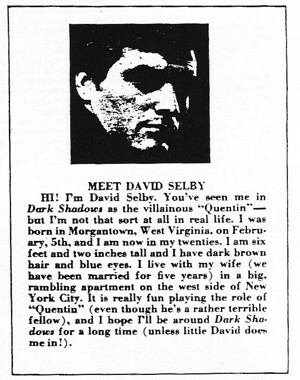 And from then on, obviously, David Selby is entirely famous. 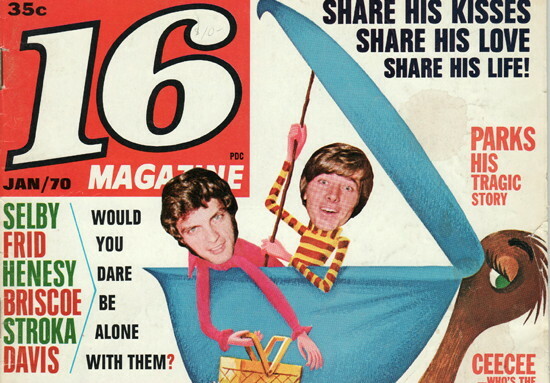 Two months later, David appears on the cover of 16 for the first time, riding a tandem bicycle with Bobby Sherman and [probably a Cowsill], along with an enormous green bear that’s carrying Denise Nickerson and a parasol. And that wasn’t David Selby’s only weird transportation experience in this period, thanks to 16 Magazine. The teen mags were always encouraging fans to stalk their favorite stars. “MEET YOUR FAV” screams the headline on the April 69 cover. “GET A LOCK OF HIS HAIR, HUG HIM – KISS HIM. GROOVIEST CONTEST EVER!” This kind of thing made David’s daily commute a little more difficult. “People were always jumping into cabs with me. I’d be forced to take a cab. I didn’t live too far from the studio at that time, but the fans were so voracious or whatever, exuberant, and just loved to walk with you. I can remember hopping into a cab, and having three or four trying to jump into the cab with me — or walking home, it was like the Pied Piper. “It was the late 60s, and I got so many peace beads. Thousands of peace beads! I should have kept them, but I gave all those gifts away. And I remember, I happened to mention that I like Sara Lee banana cake somewhere in 16 Magazine, and we were bombarded with Sara Lee banana cakes! So that’s the delightful world that David Selby has found himself in — or, rather, that Quentin Collins found himself in, and as such, David Selby, who was playing the role. Homeless kids, tandem bicycles, and Sara Lee banana cake for everyone. Who even has time for gypsy curses? Today’s episode has the first mention of Count Petofi, originally meant as a throwaway reference — but writer Violet Welles was struck by the name, and later insisted that they bring him on as a character. There was actually a 19th century Hungarian poet named Sándor Petőfi; he’s considered to be Hungary’s national poet. I don’t know if he was the inspiration for the name or anything, but there you are. Sajid Khan was in a show called Maya, which ran from 1967-68. He costarred with Jay North, the former Dennis the Menace and designated star of the show and Maya the elephant who the show was named after. Jay and Sajid rode Maya around the Indian jungle. This was filmed in India, so they really were wandering the Indian jungle. The network apparently thought Dennis the Menace would be a teen star, but once Sajid Khan was cast, that went away. He was drop dead gorgeous. 47 years later I don’t remember much about Maya except the elephant, which is hard to forget, and beautiful, beautiful Sajid Khan. A few years ago I asked Jay North if he still kept in touch with Sajid Khan. Jay said that Sajid had returned to India and was operating an Import business. “I got a greeting card from him last year,” Jay told me at the time. Dark Shadows was covered in the monster magazines of the time, too: Famous Monsters; Castle of Frankenstein; For Monsters Only, but the teen magazines like 16 and 16 Spec did indeed have much more detailed coverage. There are two DS characters in 1897 named “Sandor” and “Petofi” and played by the same actor. And DS is wonderfully insane enough for this to just be coincidence. I was in Budapest four years ago and there was a statue of Petofi near our hotel. I couldn’t resist taking a photo. 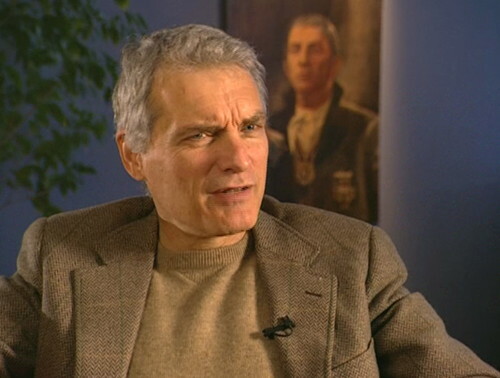 David Selby is still teen-idol-swoonworthy. First time I met him at a Festival he gave me a hug and a kiss on the cheek and laughed at my wolf joke. I swear my ovaries grew back. Even when it’s given that comical 16 Magazine treatment, that picture of David Selby has a sinister Christopher Lee kind of look. The idea of him covering his ears is interesting. Did anyone take that joke literally and decide that he must hate the Cowsills? In this episode, that moment in the foyer when Magda tells Edward, “Jenny’s spirit will not rest!”, he looks genuinely worried as they leave, as if he might for a moment actually believe that there might be something to the gypsy curse. But he’s too much of a doubter, as are all the characters Louis Edmonds plays, and he shakes it off. It will take some time before he comes to understand the true nature of what will soon be going on. Regarding David Selby’s popularity with the teen set, it makes more sense that the younger members of the viewing audience should take to him. Barnabas was not age appropriate, and his reserved persona and more paternal appearance made him seem out of place in that role. But the blood lust of the vampire has a timeless allure, one that seems even to trump middle age–Bela Lugosi, after all, was 49 when he first captivated audiences as the Count. Despite Selby’s good looks and charisma, however, it was not enough to save the show from cancellation in 1971, which had in effect ceased to be Dark Shadows the moment Jonathan Frid decided he no longer wanted to be cast as Barnabas. So, of the “big four” characters currently driving the show, perhaps Barnabas was the real key to the show’s success after all? Quentin, with his condition, had no control over his alter ego, he was enslaved and even victimized by it, whereas Barnabas had full command over his. We like that, a character that can exert control. Characters like that can really make things happen. There are several reasons why Dark Shadows was cancelled, but I don’t think Bramwell was one of them. The main suspect is HODS. We’ll get into this later as we get out of 1897 — the theme for the last year and a half of the blog is Who Killed Dark Shadows (and Should We Thank Them). Sixteen Magazine. I feel so old. But did David Henesy ever get around to cutting that record?